Many Tetris fans know that with a little time and creativity, you can add Tetris to just about anything. This commonly manifests itself in one-of-a-kind food recipes, as there’s nothing quite like spicing up your day with an edible game of Tetris. In the past, we’ve shared tutorials on everything from Tetris cookies to Tetris pancakes. However, YouTube channel HealthyJunkFood managed to take the Tetris food idea to the next level. How? By making a surprisingly healthy batch of Tetris chicken nuggets! HealthyJunkFood has become well-known over the years thanks to their ingenious pop culture-related food items. While browsing their uploads you can find everything from Mario muffins to Pac-Man mac n’ cheese. What’s nice about the DIY Tetris chicken nuggets video, though, is just how easy the recipe is to make. In less than 4 minutes, HealthyJunkFood manages to run through all the steps needed to make your own Tetris chicken nuggets at home including ingredients and preparation. 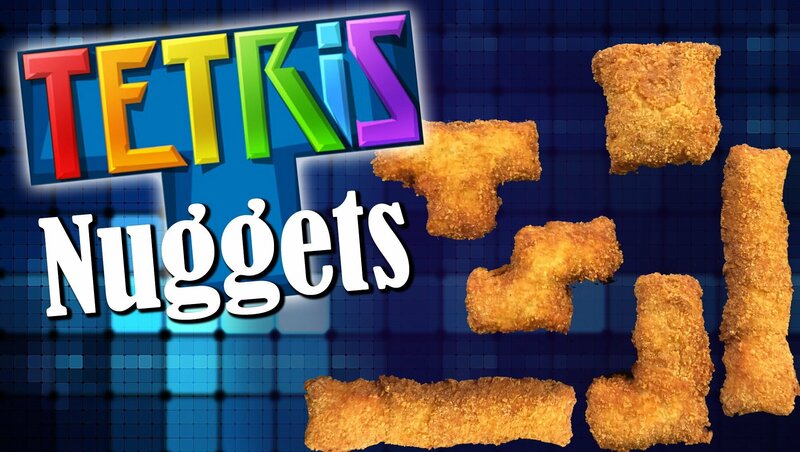 The video also ends with a clever round of chicken nugget Tetris! Arguably the best part about these Tetris chicken nuggets is how they only contain 265 calories per serving. So, if you’re looking for a new snack to serve during your custom Tetris tournament, or are attempting to spice up dinner for your kids, give these Tetris chicken nuggets a try. In fact, if you make them, be sure to send us your photos on Facebook, Twitter, and Instagram. Who knows, we just may share them with other Tetris fans across social media! Looking to play a game of Tetris that doesn’t include food? Click here to play Tetris for free right here at Tetris.com! This article was not sponsored or endorsed by HealthyJunkFood and is for informational and commentary purposes only.